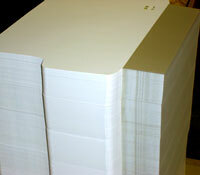 Selected ECS envelopes templates are available for letterpress die cutting. Call us if the envelope you need is not listed below. Specialty envelopes with custom flap designs may also be made using a steel rule die. Need expert help? Just email us a pdf of your project. NOTE: BOLD numbers are required grain direction. Grain wrong setup will apply.